I purchased the entire set and love the way the bed looks. The skirt fits well and the color is as appears in the picture. Very happy with the purchase and would recommend it. 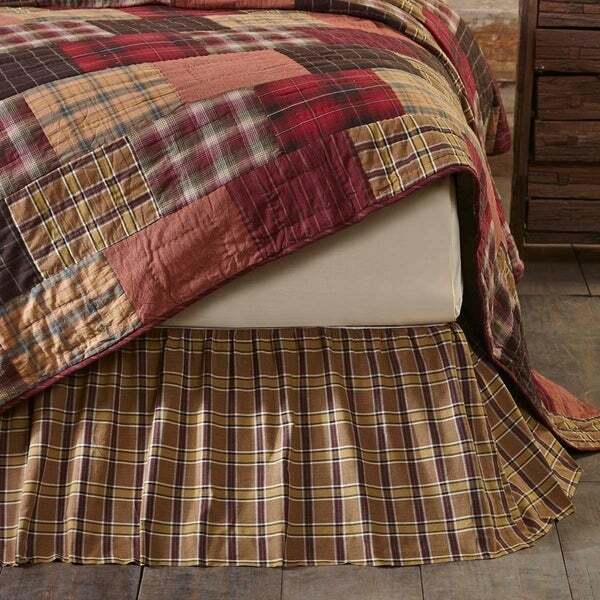 Dress up your rustic bed with the Wyatt Bed Skirt. Featuring a khaki, crimson, black, and moss green plaid with a 16" drop gathered ruffle. I love this bed skirt, it fits perfectly and the drop is also perfect!! The fabric is high quality and irons so easily.. I like everything about this bedskirt! The colors are beautiful and match the Wyatt quilt perfectly! It also came in a quick fashion and I was updated precisely as to when it was shipped and when it would be arriving through email! I would recommend this product to anyone and would also recommend using overstock. This was my first time shopping through them and I am very pleased with the whole process! Thanks overstock! Perfect fit and split at the edges! Love it! The length is great too; not too long or short. It touches the floor nicely. It matches the quilt perfectly too! Love this set! good product matches the bed spread perfect. Received in a timely manner. Fits beautiful..would recommend this to go with the comforter..
Color not true to picture posted. Too much green and no dark red to magenta. Hassle to return. First time to purchase from Overstock, Not anymore..!!! Love the quality. It had the colors and style I wanted and was one of the largest one for a California King bed. "Will this be available in queen size??"